Rome is one of the favorite destinations for brides and grooms all around the world; its history, art, food, lifestyle, and the beauty of the eternal city make it the ideal setting for an unforgettable wedding. 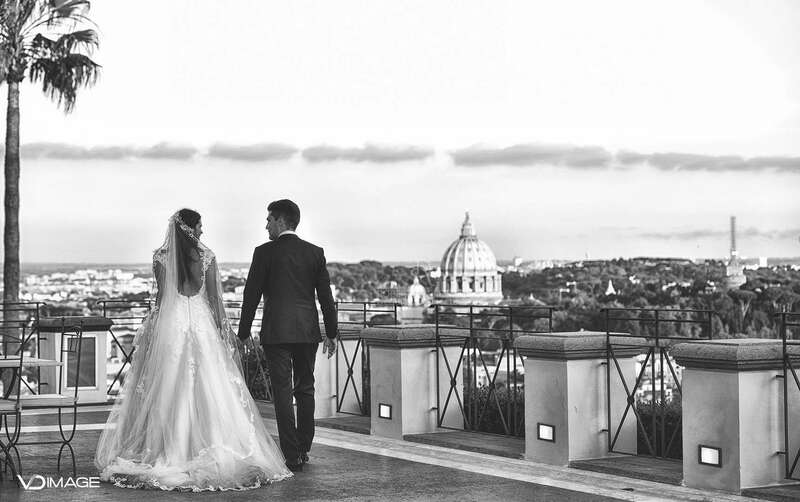 For these reasons, an ever-growing number of international couples are choosing Rome for their dream wedding. Rome offers a variety of choices that few other European capitals can match: boutique hotels, roof gardens, panoramic villas, historical castles and mansions. We offer a full wedding planning service, which will take care of your wedding’s organization from A to Z. Not only will we help you choose the best wedding venues based on your specifications, we will also plan and arrange your ceremony to the detail. Taste for beauty, eye for detail and attention for your guests are our commitment and pledge to the bride and groom, to make sure your wedding day satisfies all your dreams. We know very well all the procedures necessary to celebrate a foreign couple’s wedding in Italy, and we can offer you our best experience. From the menu choice, to the floral compositions, to the musical entertainment, your wedding day will become an unforgettable memory for you and your families. Just one more suggestion: would you like to wow your guests? Let us book the best hotels, travelling arrangements and guided tours to the Wonders of the eternal city.